Recently, the "Food Babe" (real name: Vani Hari) has called attention to the fact that alcoholic beverages (beer and wine) do not adhere to the same labeling requirements as other foods in the US. Many of the ingredients and flavors, as well as the process of brewing alcohol, is considered proprietary information for companies- they do not have to disclose these to the public under current law. In Hari's opinion, alcohol companies should post their ingredients for purposes of exposing possible allergens, health concerns of consumers, and personal dietary restrictions (such as vegan and vegetarianism) . Her biggest issue seems to be with two specific things. One is an ingredient and the other is a product utilized in alcohol fining/clarification: corn syrup and isinglass. 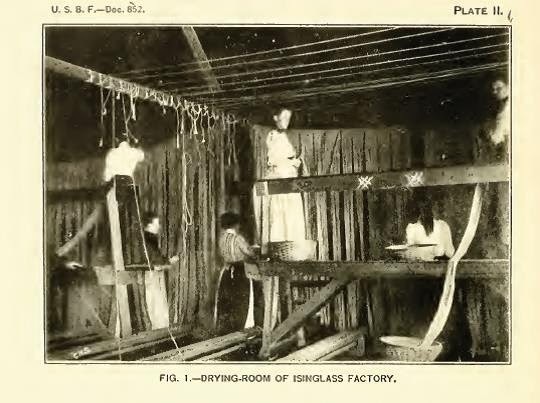 The issue of corn syrup is not of particular interest to me, but isinglass is something I have run across in my research and my historian ears always perk up when something I previously thought of only in a historical context enters current conversations. Isinglass, a term that probably comes from the Dutch word huisenblas or German hausenblase (meaning sturgeon bladder) is a gelatin product made from fish swim bladders (often known as 'sounds'). The fish swim bladder allows fish to control their buoyancy. 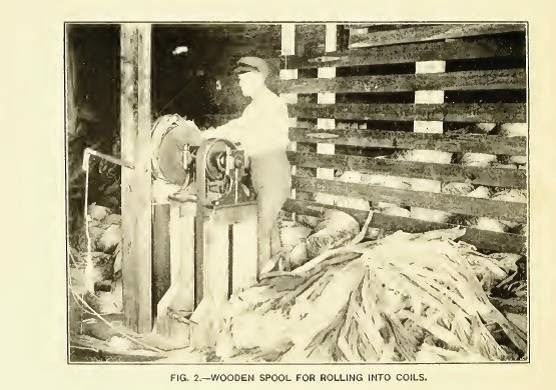 In 1908, George White of the US Bureau of Fisheries described the process for making gelatin from the collagen contained in swim bladders. The collagen of the trachea of a mammal generally requires heating to 100 degrees Celsius to transform into gelatin and the ear collagen requires heating to 110 degrees. Fish swim bladders convert to gelatin at room temperature.The sound contains a thin outer layer and a thicker layer which contains most of the collagen. The swim bladder is removed and the thicker layer is separated from the thin layer. Then the thick layer is pressed and folded into books or 'leafs'. The majority of production should be done during winter months, due to the nature of the sounds: heat liquefies and putrefies the organs pretty quickly. Check out the images below to see the process of turning hake swim bladders into strips of isinglass. I first encountered isinglass when I was researching at the Smithsonian Institution in the records for the International Fisheries Expositions. Similar to World's Fairs, these Expositions were divided by countries. Each country sent people and objects to an exposition in order to introduce their fishing culture to the wider world. More importantly, they sent a variety of products in order to interest merchants in trading in their particular goods. For example, records show that America sent fishing boats and nets, harpoons, stuffed fishes and mammals, furs from seal rookeries, and jewelry and household objects made from aquatic resources. Tiffany & Co. sent pearl jewelry and a variety of bejeweled shells and corals. 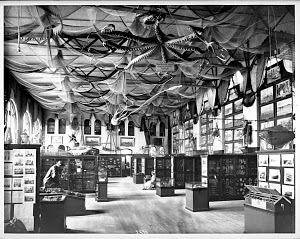 This is the Fishing Exhibit at the Smithsonian Institution, but it closely resembles the objects and arrangements at Fisheries Expositions during this period. In addition to all of these objects, the biggest displays often revolved around industrial products. America sent tons of canned and dried fish, prepared and preserved in the newest fashions for the widest audience. And, they sent isinglass. When I entered the archives in Washington, D.C., I kept running across the word isinglass. I had no clue what the heck it was, but I knew that the US sent isinglass to the Berlin Fishery Exposition in 1880. 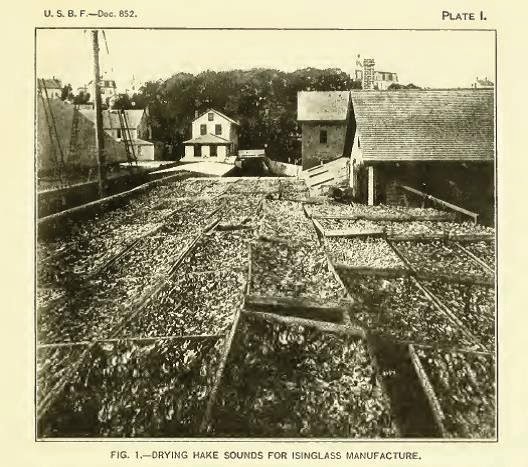 Quality isinglass could be used for a variety of purposes, including as a fining agent, glue or cement, and for food (think jello but with a slightly fishy flavor). The best isinglass was made from sturgeon sounds in Russia and could be used for envelope and stamp glue, as a fining agent, or as a food. The cheapest, often made from fish species with less natural collagen in their sounds, was used for glue or heated and mixed with other products to form a rough cement. Russia was the largest producer of isinglass at the turn of the 20th century. Sturgeon sounds were considered the best swim bladder to produce isinglass- don't forget that sturgeon also produces caviar. So you might see why sturgeon are so endangered these days- producers of two very large Russia exports. 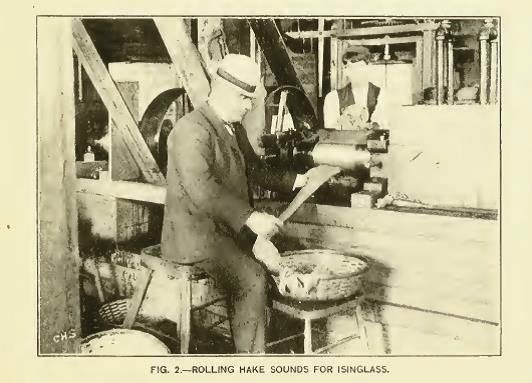 Iceland also produced isinglass with cod sounds. Isinglass was used for a variety of purposes throughout the 19th century, including envelope and stamp glue and even as a source of edible gelatin. However, by the first decade of the 20th century, isinglass was mainly used to make glues, cements, and as a clarifying/fining agent for beer and wine. Fining agents are substances used in alcohol making to produce a clearer liquid at the end of fermentation. Yeast and other particulates from the brewing process lead to an opaque liquid. If you wait long enough, the particulates will eventually settle, but brewers often utilize a variety of fining agents to clarify their liquids. Isinglass is one and another popular one is Irish Moss. Irish Moss is negatively charged and binds to positively charged proteins in the beer mixture before it has been completely fermented. After beer and wine is finished fermenting, a fining such as isinglass is used: it is negatively changed and binds with positively charged yeast. Basically, both of these fining agents allow particulates to clump together and form large, heavy pieces that sink to the bottom of the fermenting vessel so that the liquid can be easily strained. Using this fining agents results in a clearer liquid. beers, levels of isinglass are below the limit of quantification. Obviously, many vegetarians and vegans are concerned that any animal products have been used in their food production, so the lack of isinglass in the finished product is meaningless if this is your concern. However, if your concern is allergic reaction to fish, suffice is to say that it would be very difficult to react to such a trace amount in the finished product. I have no side in the fight about beer labeling. Instead, I'm interested in the near invisibility of certain marine products in seemingly non-marine foods and products. Similar to the widespread use of seaweed in food products, isinglass is an important in the alcohol production process, yet many people know nothing about it. When we think of fishing, and harvesting from the ocean, we imagine fish and shellfish- whole organisms destined for human consumption in a restaurant. It isn't until we really understand how integral invisible marine products are to our daily lives that we can understand the impact that we have on the ocean. And in turn, the impact of our destruction of the marine ecosystem will have on the way we currently live.